Is this big wheeled shape-shifting enduro bike up to speed? Editor’s Note: This post was written by Mtbr contributor Josh Patterson. 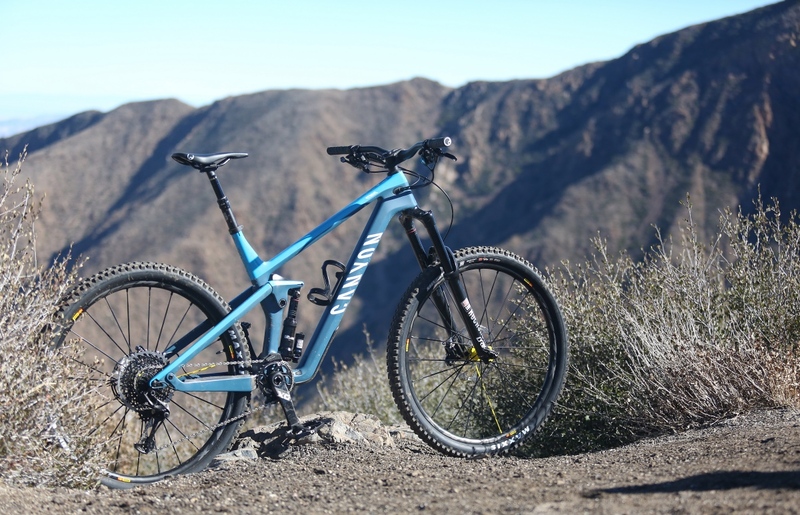 Canyon has revamped the Strive with 29er wheels and longer, slacker geometry. 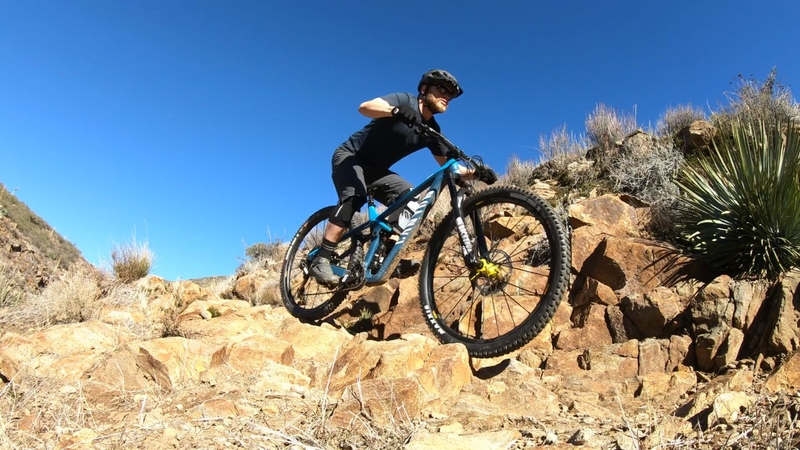 This aggressive enduro bike is also equipped with an updated version of the company’s Shapeshifter system that allows the rider to change the bike’s geometry and rear suspension travel on the fly. 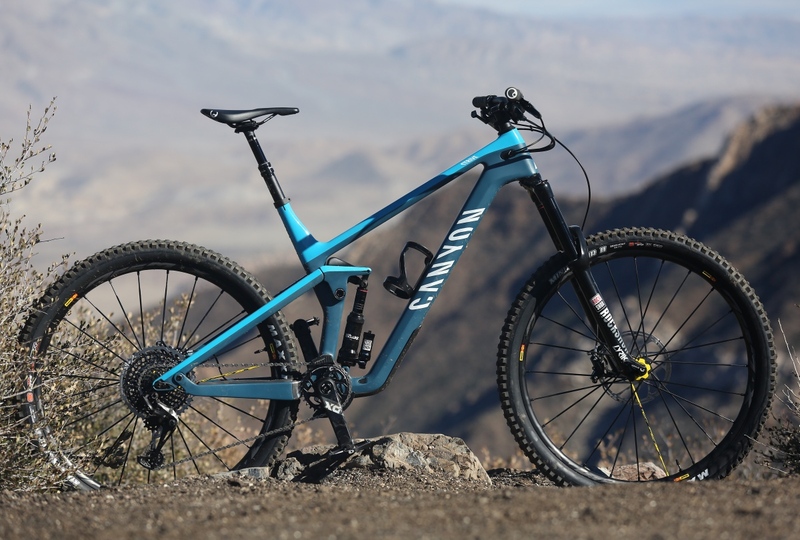 The Canyon Strive CFR 9.0 Team sits one rung from the top in Canyon’s Strive line-up. However, it is the highest of the three trim levels that will be offered in North America, selling for $6000 when it becomes available in early February. The Canyon Strive CFR 9.0 Team sports 150mm of rear wheel travel via a Horst-Link suspension and has a 170mm RockShox Lyric RC2 fork up front. This is a slightly burlier, and slacker, build than the two other models, which come with 160mm forks. 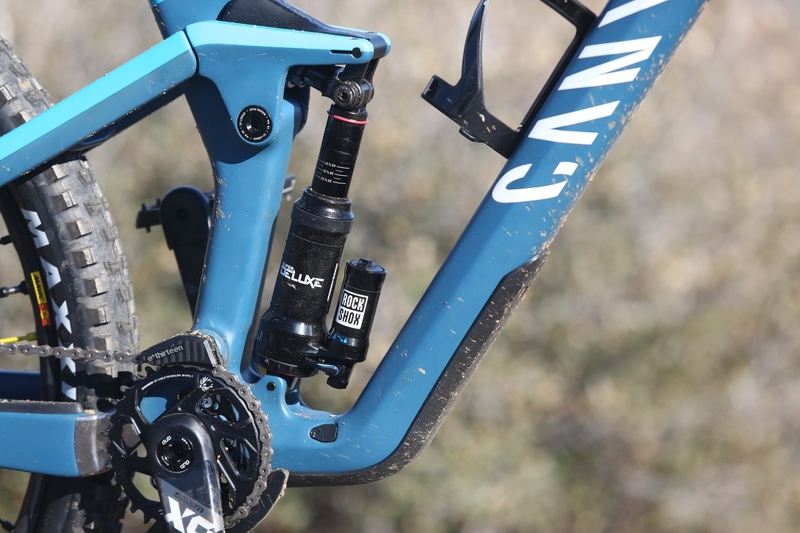 The technology that makes the Canyon Strive CFR 9.0 Team stand out from the multitude of long-travel 29ers is tucked cleanly into the frame’s rocker link. 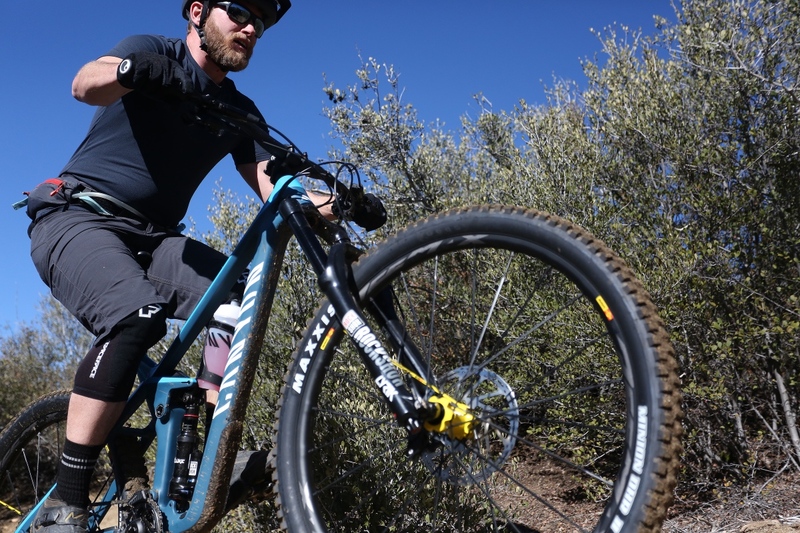 Canyon’s Shapeshifter 2.0 system uses an air-sprung piston to allow for on-the-fly adjustment of the Strive’s rear suspension travel and geometry. Learn more about Canyon’s Shapeshifter technology here. In the case of the Canyon Strive CFR 9.0 Team, switching the frame into the climb-friendly mode reduces the rear wheel travel from 150mm to 135mm, steepens the head tube angle from 65.5 to 67 degrees and the seat tube angle from 73 to 74.5 degrees, and raises the bottom bracket a few millimeters. 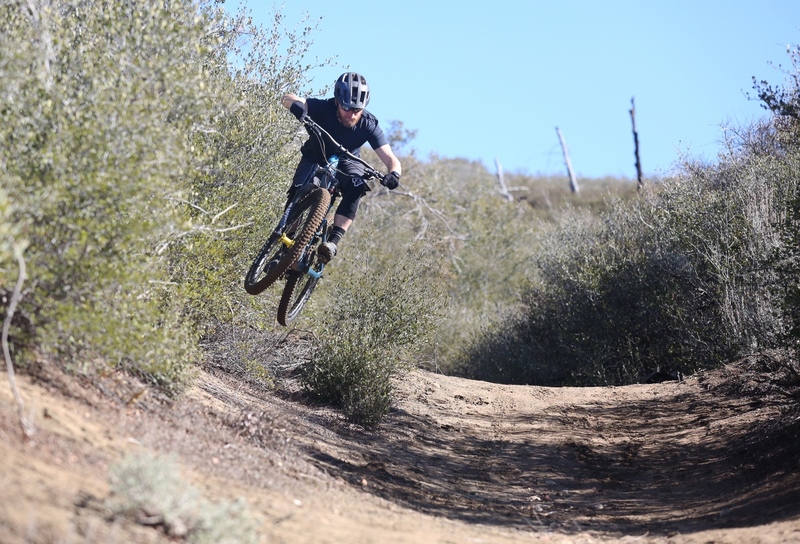 Even in steeper mode, the seat angle isn’t particularly steep when compared with similar models from other brands such the Yeti SB150, Ibis Ripmo, and Transition Sentinel, which are all in the 77-degree range. So is this shape-shifting rig up to speed? Canyon hosted a group of journalists, including Mtbr, at its U.S. headquarters in Carlsbad, California. 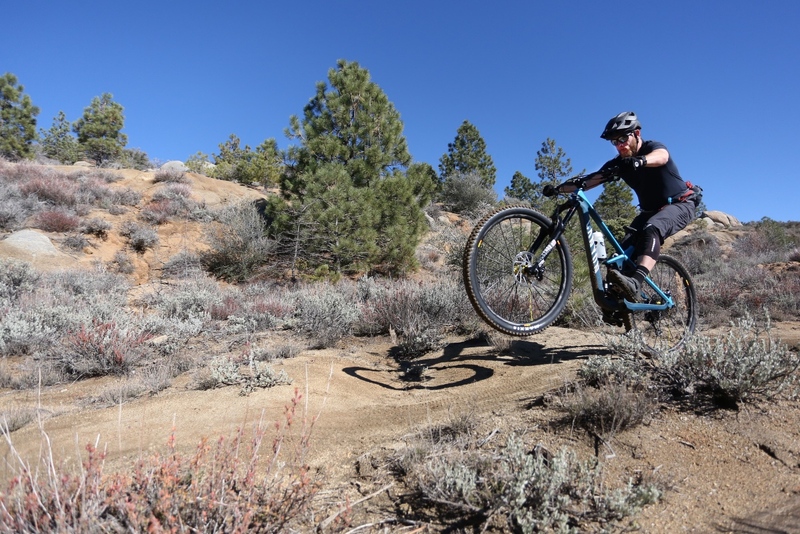 My sole test ride on the Strive was a three-hour, 20-mile ride on the SoCal classic Noble Canyon trail system. The terrain consisted of loose, rocky climbs and a mix of flowing and rocky singletrack descents. 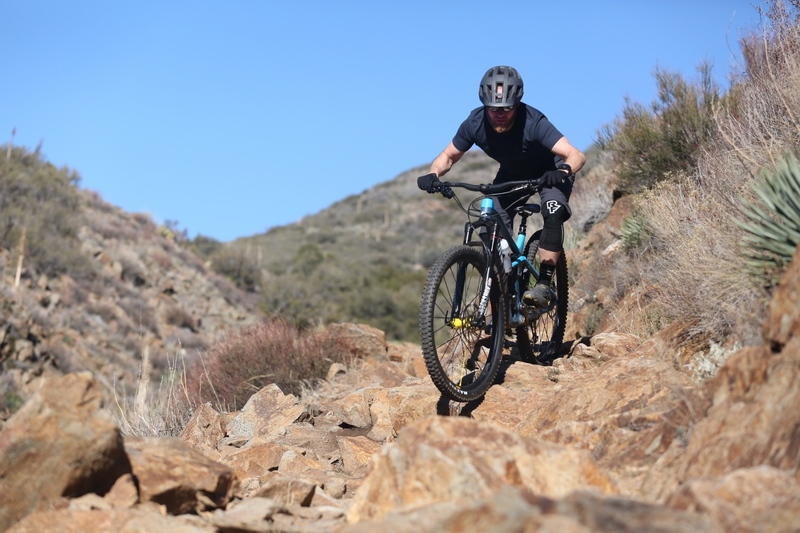 How much marketing ink has been spilled waxing about trail bikes that, ahem, “climb like cross-country bike and descend like a downhill bike?” Well, I’ll cut to the chase: Shapeshifter 2.0 does neither of these things. It does, however, make the Strive a more nimble climber without sacrificing downhill performance. The rear suspension does a good job balancing traction with pedaling performance. When the Shapeshifter system is engaged and travel shortened the rear suspension remains active and retains traction. I found this to be a benefit when scrambling up loose, rocky climbs. 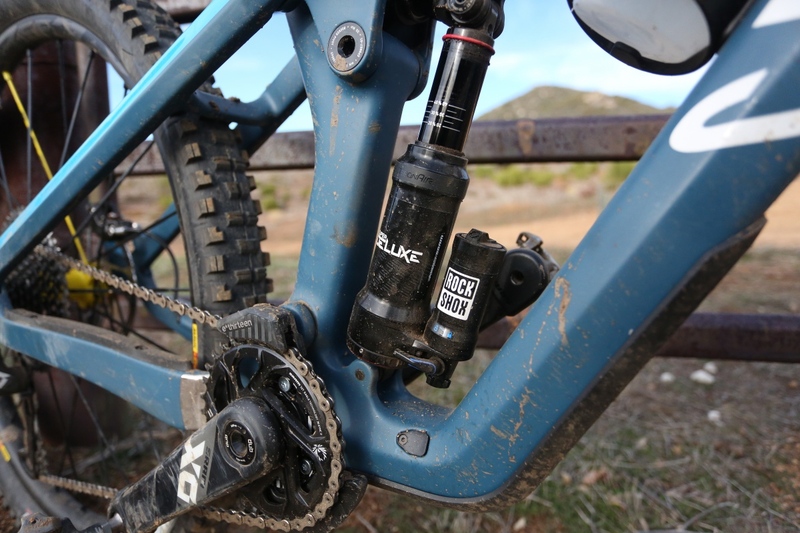 If you were riding to the trails, you might want to consider flipping the platform lever on the Super Deluxe RCT shock, though I had no need on this ride. The leverage rate of the Canyon Strive CFR 9.0 Team increases in the shorter-travel mode making the rear end feel a bit more poppy. This sporty feel isn’t just useful for climbing, but also for rolling sections of trail. I found myself switching to this mode any time the trail flattened to better pump out of corners and boost off small obstacles. 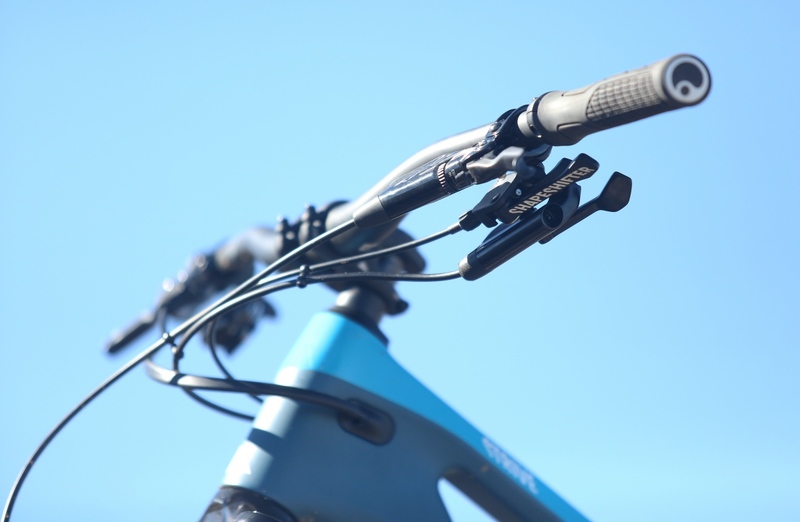 The Shapeshifter levers sit on the left side of the handlebar where the dropper post lever is usually positioned. 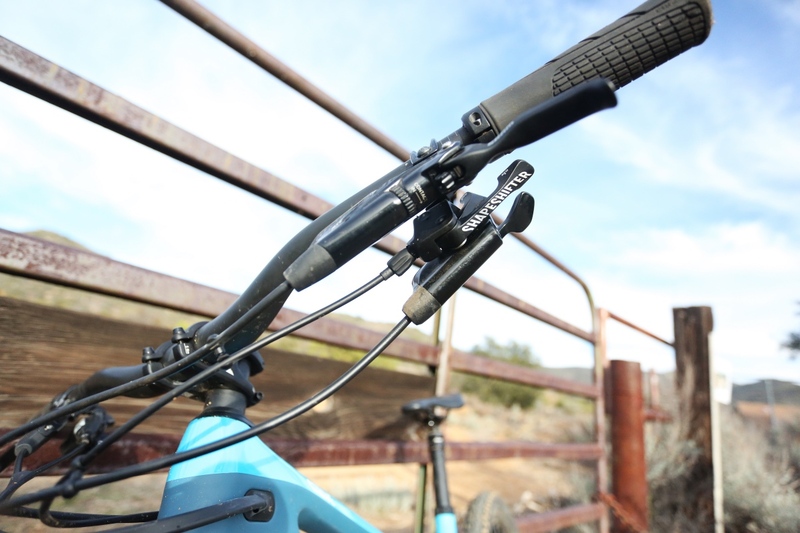 One lever labeled “Click” puts the rear suspension into the shorter, steeper mode. Pressing the “Clack” lever returns the rear suspension full travel with slacker geometry. 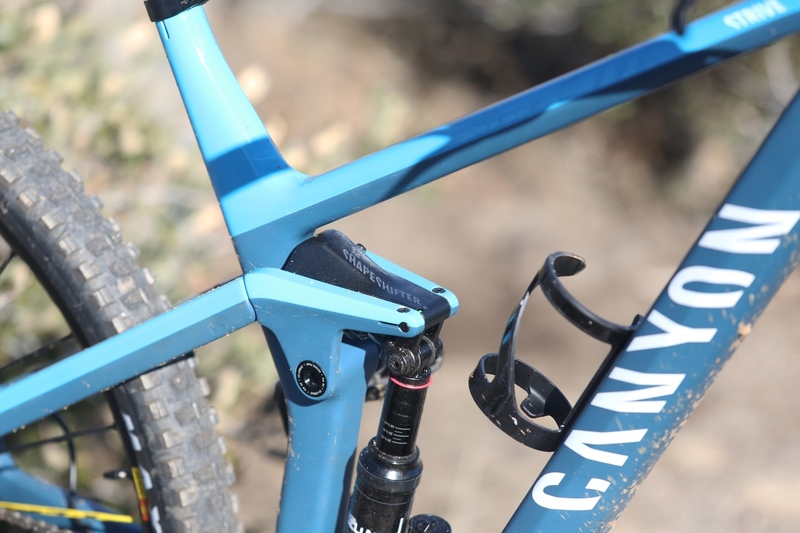 Thankfully, Canyon had the foresight to realize many mountain bikers would not take kindly to moving the dropper lever far from their comfort zone. 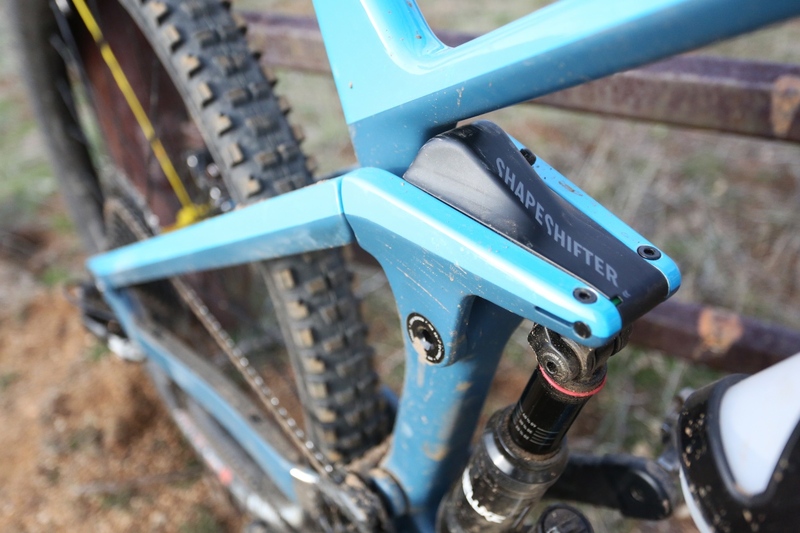 A Matchmaker-style mount at the bottom of the Shapeshifter lever allows the dropper remote to sit a bit lower than usual, but still within thumb’s reach under the bar. After a few fumbles, I got the hang of this new three-lever layout. By the end of the ride switching through the modes and dropping my seatpost was all ingrained muscle memory. 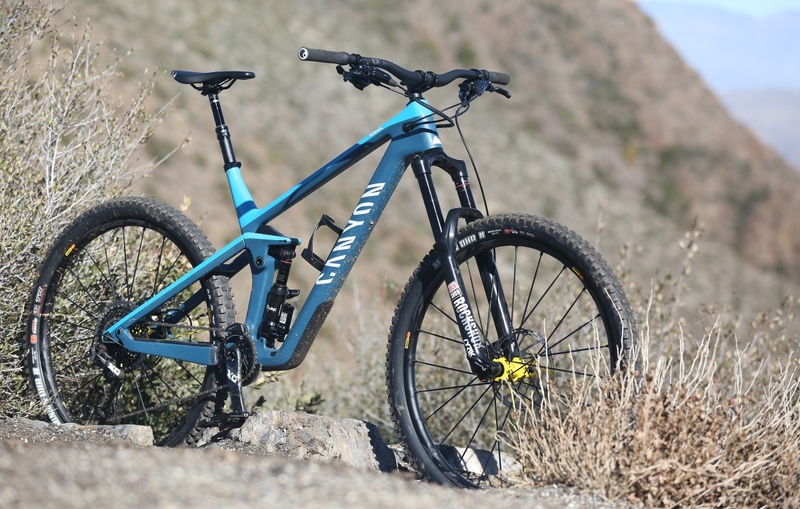 The Canyon Strive CFR 9.0 Team isn’t a class leader when it comes to long and slack geometry, and that’s not necessarily a bad thing. While it will be raced at the Enduro World Series, it was primarily designed with weekend warriors in mind. 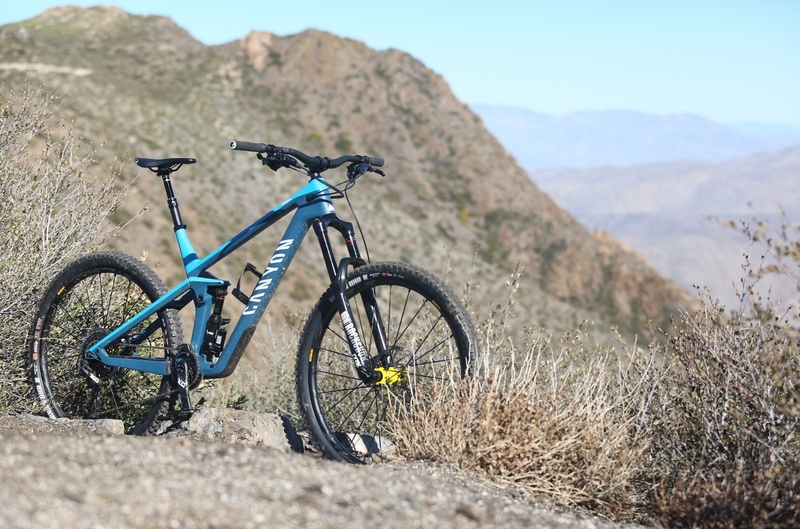 “Ninety-percent of the people riding this bike will be riding it on their backyard trails,” said Devin Riley, Canyon’s U.S. director of marketing. Check out spec and pricing info on the other Strive builds. The Canyon Strive CFR 9.0 Team has well-rounded handling and doesn’t require the rider to go mach-chicken before it comes alive. That said, the relatively slack seat tube angle will be noticed by riders accustomed the steeper positioning found on many of the Strive’s competitors. Instead, the Strive requires the rider to be a bit more attentive when picking a line while climbing. This raises the question: Would Shapeshifter 2.0 be necessary if the bike had a steeper seat tube angle? 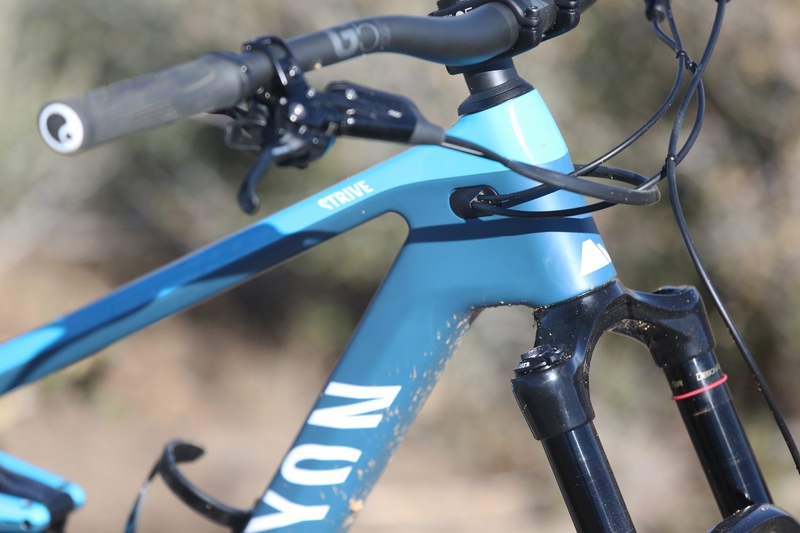 We have a Canyon Strive CFR 9.0 Team on the way for long-term test to answer that question. Stay tuned. Visit www.canyon.com for more information. Yes there is room for a full size water bottle inside the main triangle.